- UKIP will ensure the NHS is free at the point of delivery and time of need for all UK residents. - We will stop further use of PFI in the NHS and encourage local authorities to buy out their PFI contracts early where this is affordable. Worth looking at this link, going to MPWatch and selecting Charlie Elphicke to see how he has voted on EU issues. Not what most Conservatives would agree with I would think. In the face of the UK being forced to handover an above-inflation increase in Britain's EU budget contribution when the Government is poised to make reductions in public spending elsewhere; Douglas Carswell MP proposed that this increase is wrong and that the contribution made by British taxpayers' to the European Union should be reduced. The Government opposed the motion. Charlie didn't vote. A few years later it finally dawned on Douglas that he was representing a pro EU party. Considering UKIP have to get a extremely large number of seats come the General Election to make a difference to either of the two main parties it does not really matter about their policies. Should they get enough to take part in a coalition they will be like the Libdems and act as a brake over any policies they happen to strongly dislike. Best tell Farage that as he clearly doesn't know. The tax credit issue will raise its head in the run up to the election as a lot of newer UKIP supporters are in receipt of it and will not be happy to lose it. Ah but was it not Mr Little himself saying only a few posts back I would like to see the reds back in power just to take the smile of the PM face. They have seen sense and dumped Hamilton. The voters don't want all these old guard politicians, labour or Tory. They won't fresh faces that represent all society and backgrounds. What the voters want are politicians who are honest and do what they promise, what we get are those who lie and then feather their own little nest at our expense. Have you ever heard of an ex MP who struggles financially when they loose their seat? This is why so many no longer bother to vote they have completely lost confidence in the lot of them regardless of party. I have been asked time and time again put your hat into the ring again next year, and up till now I have said no Why. ? (1) I do not have the cash anymore to pay to do it. (2)I do not get a lot of support untill things go wrong then I get told we will vote for you next time round mate go for it. But when the time comes to go to the polls that support has gone.But again you never know if funds come my way then I might just go for it but knowing I cannot not win but it might stop like in the pass a party winning that I think will not be good for our town and and district .As you know that I have been kicked out of a party that I supported for many years that happen because I went for a council seat againts a member from the same party.So I would be standing again on my own. Just had a look into the Dover forum blog great photos of the UKIp leader and myself holding up his book do not know how it got on there that was done at a meeting up north . 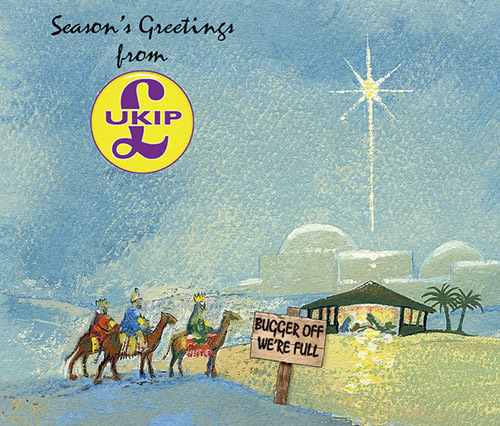 Well at least the UKIP Christmas Card has a religious theme. Dover Christian Chronicle winter issue 2014.You might be thinking what does this have to do with UKIP. I picked it up on the way out from church today. And on page 8 there is a lobbying of our parliamentary candidates to elict,getting their views on overseas development. I will not go into their views unless asked to do so.But there was the views of Mr C Elphicke of the blue party.. There were views from Miss C Hawkins of the red party.And Mrs S Smith of the yellow party. Now we come to the last party to stand UKIP And Mr D Little. We have on three occasions asked the UKIP candidate Mr D little if he is prepared to meet us but have not received any reply. We then wrote to him asking the questions we have asked the other candidates but again received no reply. We understand however that UKIP policy is to cut overseas aid substantially. I will say now that would have never happen when I was chairman of UKIP,or when I was UKIP candidate at the last parliamentary election. I would all ways give out UKIP views or my own to any group or person that asked for it even if that view was not the same as the group or person asking the questions. So like myself you might be thinking why in this case the UKIP candidate did not give out his views like the other party,s candidates. No real surprise there politicians like to tell the audience what they want to hear and back off when they cannot do it. I believe the word is duplicitous. Thank you in most cases I think you are right . and here before coming to any conclusions about this article. Not for the first time people on here are spouting nonsense without being in possession of the facts, its far easier to assume something rather than establish the truth. Lets just say that the editor of the publication Mr Matcham refers to has been in contact with me, belatedly, and I'm going along to meet his committee shortly. I'm sure Mr McSweeney will claim I'm being duplicitous, but as usual he has no idea what has occurred.